Several Saturdays ago was a beautiful bright sunny day at the ‘Feather Falls Casino’. We were judging a ‘Three Meat’ BBQ competition. Our judging duties had been fulfilled and we had several hours before the award ceremony. We had received a hot tip of a local butcher who smoked and cured bacon. 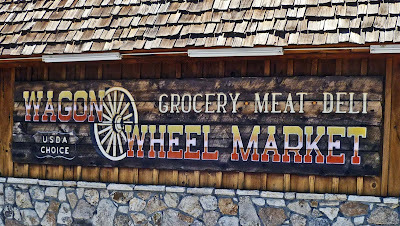 This was the perfect opportunity to go on a ‘Meat Adventure’ to the ‘Wagon Wheel Market’ in Orville California. We jumped into the ‘Racing Honda’ grabbing a fellow judge named Butch and raced to our meaty destination. 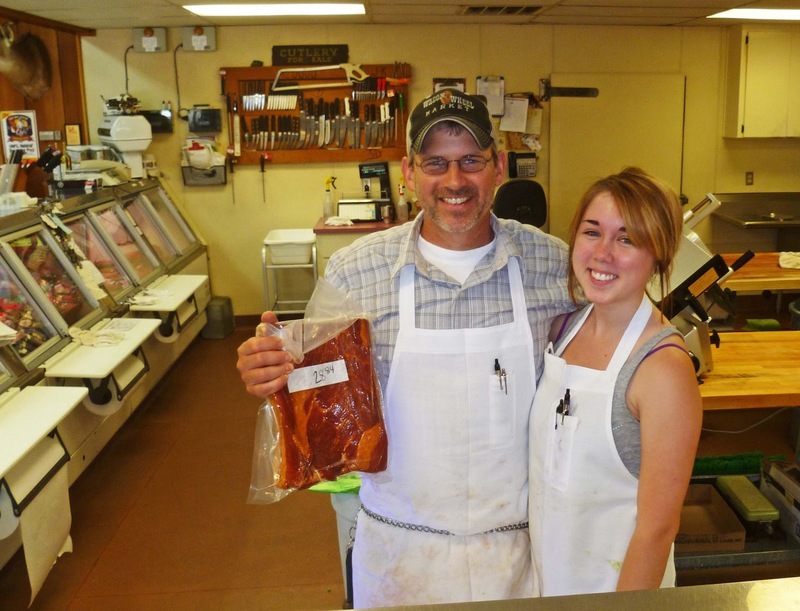 The Wagon Wheel Market is an all purpose general store with a full service meat market. The meat market has; ‘Award Winning Smoked Meats’, complete sausage kitchen, wild game processing, ranch butchering and USDA choice certified premium beef. 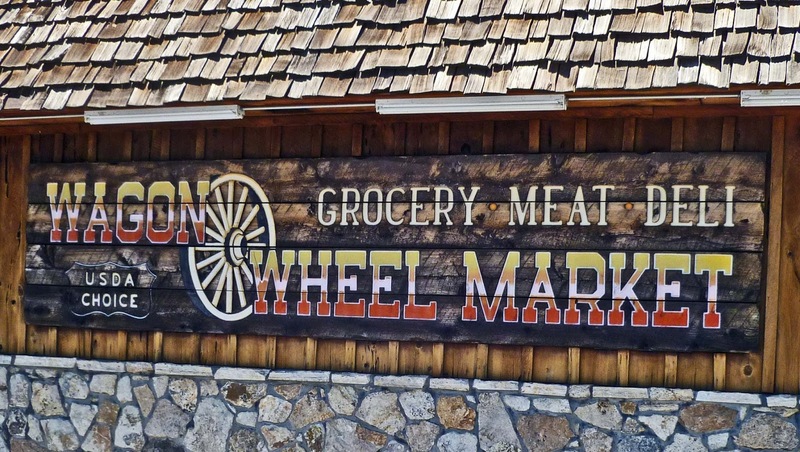 For over 30 years the Wagon Wheel has been run by the Butler family. We were lucky to meet Pat Butler the head butcher. Pat was more than happy to answer our numerous questions. Pat uses hickory wood to smoke his bacon. The cure includes maple and cane sugar. No phosphates are used in this process. This bacon looked fabulous. We loaded up our cart with sausage, beautiful meaty smoked ham hocks and of course bacon. We returned to the BBQ event. Our purchases were safely tucked away in our portable ice cave until we returned home. 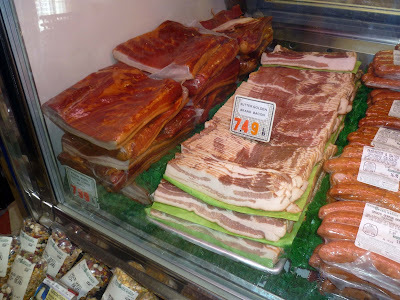 We had to wait several days before we returned home to try our bacon. This slab had a beautiful shiny sheen created by the cure and smoke. We cut into the slab and saw the meat to fat ration was of equal proportions. 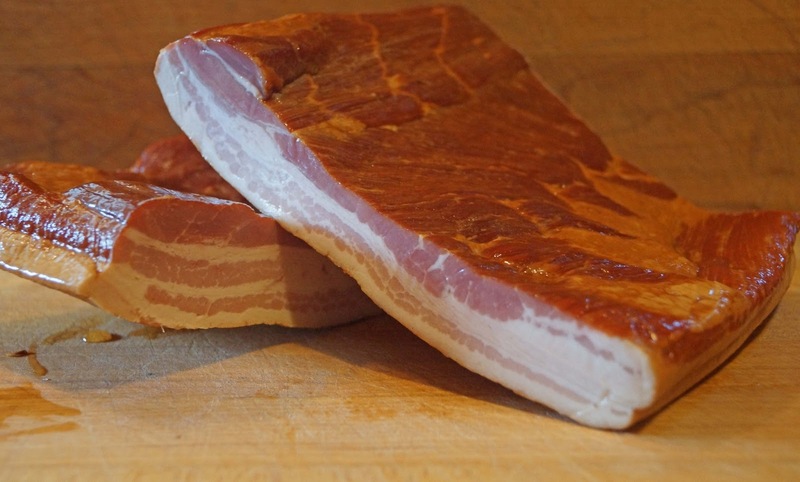 We sliced some rashers and cooked them in our trusty black iron pan. 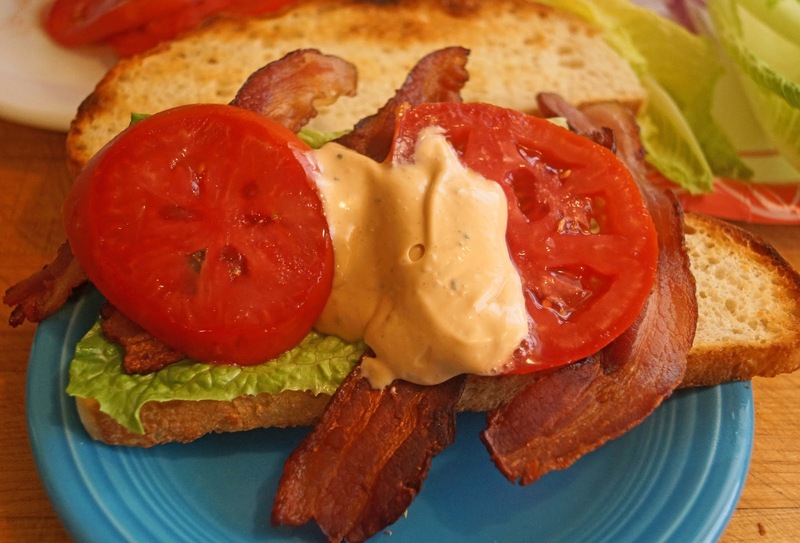 The vehicle to test drive this bacon would be a bacon, lettuce and tomato sandwich. The bacon fried up perfectly crisp. It had a wonderful meaty flavor. It leaned on the sweet side with its maple flavoring. Salt and smoke was in perfect balance. This was quality bacon that we enjoyed. Bingo!!!! We shall definitely return to the Wagon Wheel Market. It is always a pleasure to have a successful Meat Adventure. I have been buying my ham shanks from them for years. They are the best. Bacon Guru I salute you! This is making me very-very hungry. Beauty! But jeeze, Oroville is so far away (I know you had a good reason to be there). Guess I'll keep making my own. alumanutz, do you know my cousin alumanardz? How lucky you are to have the Wagon Wheel. We bought a ham shank and will be cooking it shortly. I am going to get some fresh cranberry beans from the farmers market for my bean pot. Greg, Thankyou, it is a calling. Three Dogs BBQ, some of our best resources are word of mouth. Just asking a local provides knowledge. cookiecrumb, If you would desire, We will be returning in August for another competition. I can pick you up some yummies. There is one catch. You would have to leave the confines of your castle and meet us at the Sunday market for delivery. Once again, you scored big! We have a pound of Nueske's in the fridge - BLATs tonight for dinner.